This can be personally delivered TODAY in the Indianapolis area,	or by carrier on 4/30/2019 outside our personal delivery area. 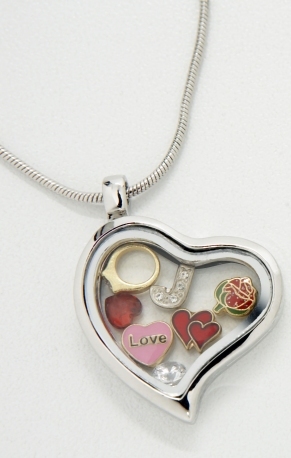 Forever in My Heart lockets are a beautiful way to symbolize the special people and events of your life. It is Rhodium plated (nickel and lead free) with tempered glass on both sides. The chain adjusts from 16" - 19". Charms or photographs are easily inserted via a magnetic opening. It will hold up to six charms depending on the charms selected. Choose your charms below.